North of Mt Kenya is the remote Samburu National Park. It is often regarded by travellers and guides in Kenya as the best of Kenya’s national parks. The drive from the foothills of Mt Kenya treats the traveller to an unusual spectacle of green bush and forest on one side and a desert landscape on the other. Like in all of Kenya’s national parks there is no shortage of game here and there are frequent sightings of all of the big cats, as well as all of Kenya’s plains game. Samburu is also home to the specific northern species including the reticulated giraffe, gerenuk, vulturine guinea fowl & the grevys zebra. Visitors will also be privileged to see the red-robed Samburu tribesmen bringing their cattle down to the river to drink. The lives of the Samburu, like the Masai, are centered on their livestock, which are their traditional means of survival. After initiation, boys become 'morans' and it becomes their duty to protect both the humans and the livestock from predators. Samburu is a hidden gem with some of Kenya’s finest lodges set within its borders. 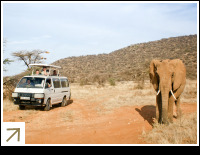 Below are some of our recommended tours that take in Samburu but if you'd like us to tailor the experience to suit you plans get in touch with us and we'll see what we can do for you.